We stayed at 1894, Ilikai Marina for just under a full week. The place was VERY clean and modern. Completely comfortable in every respect. My wife and I slept in the King Bed, and that separate bedroom has an awesome view out over the marina, to the ocean. Our teen daughter slept on the pull out sleeper sofa, and she was quite comfy as well. The place is really quite spacious as far as condos go, and the kitchen lacked for nothing in my view. The nearby grocery stores made it easy to eat on a budget, rather than having to eat out every day. The balcony is extremely tight, but still, can squeeze two chairs on it, and the view is priceless. 180 degree panoramic view of the ocean, and nearby high rises, particularly gorgeous at night! This unit is located at the very top floor (18th) and on a corner, so any possible neighbor unit noises are reduced by 50% (no one above, or to one side). The TV remotes are a little tricky to figure out, but both TV's in bedroom and main room work great. The A/C works fine, but frankly, just open the door to the balcony and the weather is perfect 24/7. We would absolutely go back there at the next trip to HNL. The price was very fair, and the owners are super responsive and accommodating! Generally a nice, well located condo. The kitchen pots, pans, dinnerware, wine glasses, etc all seemed on the cheap and dated side. There isn’t a good spot for the trash can except in the middle of the kitchen floor. The deck, unfortunately, isn’t useable by two persons. Otherwise it was comfortable and convenient for our week. 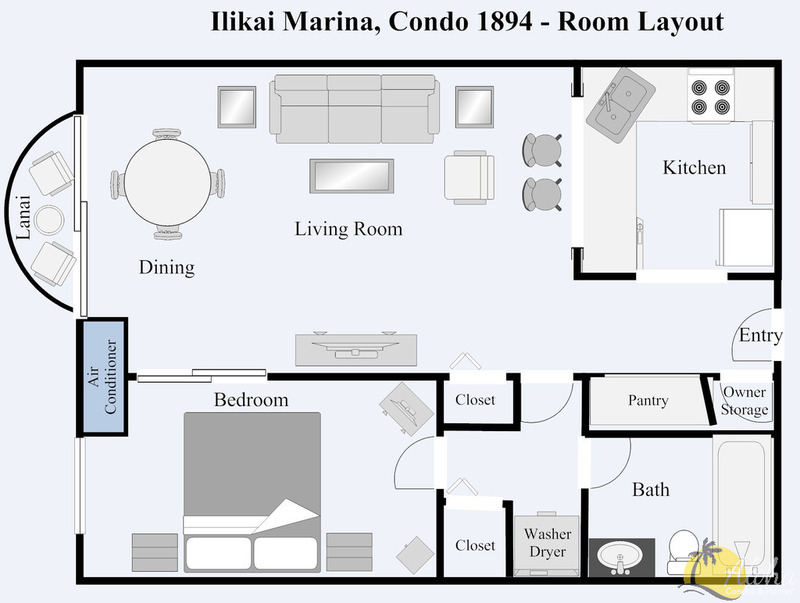 Thank you for responding to our request for a review for the unit 1894 at the Ilikai Marina. It is a nice unit and a great location conveniently near everything. The decks are smaller in this building but the view is expansive and amazing! There are the two deck chairs that are for the deck seating supplied in this unit. I guess the comment on dated dinnerware is relative to what style one might like as it sounds like the kitchen supplies were functional. We are glad you found the unit comfortable and convenient and hope you can return. This condo is very well apppointed and in a great location. Stunning sunset views. One block to the beach. Wheelchair accessible. Just wish we had more time to spend there. We stayed at 1894, Ilikai Marina for just under a full week. The place was VERY clean and modern. Completely comfortable in every respect. My wife and I slept in the King Bed, and that separate bedroom has an awesome view out over the marina, to the ocean. Our teen daughter slept on the pull out sleeper sofa, and she was quite comfy as well. The place is really quite spacious as far as condos go, and the kitchen lacked for nothing in my view. The nearby grocery stores made it easy to eat on a budget, rather than having to eat out every day. The balcony is extremely tight, but still, can squeeze two chairs on it, and the view is priceless. 180 degree panoramic view of the ocean, and nearby high rises, particularly gorgeous at night! This unit is located at the very top floor (18th) and on a corner, so any possible neighbor unit noises are reduced by 50% (no one above, or to one side). The TV remotes are a little tricky to figure out, but both TV's in bedroom and main room work great. The A/C works fine, but frankly, just open the door to the balcony and the weather is perfect 24/7. We would absolutely go back there at the next trip to HNL. The price was very fair, and the owners are super responsive and accommodating! I make it a rule to stay at likai Marina Cond in Oahu, because the life amenity is well equipted and is satisfactory . The scenery of yacht harbour and beautiful sunset from the room is so splendid and everybody would be satisfied with those. Wifi system is complete.The location is so convinient for marine activities and famous shopping centers. It was our 3rd stay at the Ilikai Marina on different floors. On the 18th floor it was much quieter than what we had experienced before. We love the view, and easy short walk to Ala Moana shopping centre. We hope next year we can come back and stay again in your lovely condo. Thankyou for sharing it with us. We enjoyed our 1 week stay at this lovely condo. The 180 degree view is spectacular! We can see all ocean activities right in front and even a full rainbow! Being in the quiet corner of the builing and on highest floor, the condo was very quiet. The condo is well decorated, very neat and clean throughout as in pictures! Kitchen is equipped with essentials. The bed is comfortable! Aloha Condo management is prompt in responses to any questions and notifications where needed. We'll stay here again. I do hope management would cover parking fee or at least cover a portion of parking fee in the future for 1 week or longer stay. The condo was just like coming home, very clean and comfortable.We loved the location with the beautiful sunsets every evening.There is a ABC Store close-by for any supplies you may need.Very thoughtful addition of chairs and boogie boards in the cupboard, alsotowels for the beach. Will definitely stay again. Overall, I would have to say that this condo is a fantastic place to stay for anyone vacationing in Honolulu! The unit stayed nice and cool, the view was amazing, and the location made it super easy to walk to multiple eating/shopping establishments! We only ran into a couple of hiccups on our 10 night stay. First, we were not allowed to use the washer/dryer in the unit, which was the primary reason for choosing it. At the time of booking, there was nothing stating the use restrictions. Second, the plumbing in the building had to be shut off on the day before departing due to scheduled maintenance. Totally not the fault of the unit owner....just an inconvenience since we needed to do a lot of laundry and packing (a LOT of packing) that day. Also, trying to fight for the washer/dryers on the 8th floor was a challenge during this trip (busy busy). FYI, make sure to bring a lot of quarters for the machines!! There are NO change machines in the building! Despite these minor issues, we absolutely loved the condo! It was clean, bug-free, and super quiet. A huge thank you to Gillian and Vlad!! We stayed in this Condo for ten days in February 2018. It was great, very comfortable and clean, The view was five star, so much going on in the water out the front of the room it was very entertaining and we could see the fireworks on Friday night perfectly. All the modern facilities were in great order, the main bed was very comfortable, (new?) as was the futon after adding a quilt top to the top of the mattress. It was very quiet at night as it is the last room at the end of the floor, Staff were lovely, especially Steven in the office at ground floor. We had no trouble with any appliances. We can recommend this Condo. Like Home! Fully Equiped! Best condo in Waikiki! My daughter and I rented from Vlad and Gillian 2 years in the row! Amazing hosts, very friendly, respond quickly to emails and their condos have everything you need! We traveled to Waikiki many times, but these condos outdo them all in Waikiki! View from condo is so BEAUTIFUL! We enjoyed looking at the boat harbor, ocean and the beach, you will see many sail boats. On Fridays we watched Fireworks from the balcony. Location is GREAT! Condo is located in the quiet, safe and clean part of Waikiki, right next to Hilton Village Hotels. There are many shops, restaurants, cafes, live music, and scenic spots. You can take a 9 minute ride on the bus to downtown of Waikiki or go for a nice 15 minute walk thru DeRussy Park. Condo is FULLY EQUIPED and RENOVATED! It’s clean, fully renovated, furniture is new and bed is big and comfortable! Bathroom is also new. Hosts provide everything... Kitchen supplies: pots, pans, coffee maker, toaster, microwave, rice cooker, and much more…. everything is new and working! They provided beach chairs, umbrella (you will need it) as well as shopping cart on wheels so you can shop for food at nearby ABC Store. Condo is very nice looking on the inside! We recommend this condo to all of our friends. We could not express how happy we are with this condo and are planning to come back here again many times! Have recently spent several weeks in the condo. We were mostly self catering and found that all the necessary cooking utensils were in the accommodation with a recently modernised kitchen area.In addition beach equipment and towels etc. were provided.Altogether an excellent apartment with fabulous sea views and sunsets. Not forgetting the grandstand view of the fireworks.Thoroughly recommended. What a great condo! We were only there a couple days but wow. Condo had everything we needed, from beach towels to cooking utensils. I went to bed early (tired from all day at the zoo :) ) but the sliding door on the bedroom meant that my daughter could finish watching her movie without bugging me. Room stayed cool the whole time even though it was cooking outside. Amazing sunsets over the marina each night and you can see the incredible (free) fireworks display from the lanai (balcony).